The newly-designed area of my back garden. There are more photos on my latest blog. Lots of colour Terra, such a good backdrop to your garden, you use your plants very well indeed. What a lovely scene to look out on Terra! Thanks, Sandra... Yes, that's heuchera. Clearer close-up pics on my latest blog. :o)))...love the close up ! Hi, TT, your garden is brilliant - so pure in lines and colours. What is the name of that beautiful bush with white flowers? I think you have already mentioned it somewhere, but I forgot. It is amazing. If I made a wish in your wishing garden, would it come true ? Thanks Kat... not sure which bush you mean ? I mean the largest one in the left side of the picture. Or is it climbing plant over huge fence? Thanks for explaining which one ! That is a trellis covered in Winter Jasmine and roses. Winter jasmine....never heard it. Have to google it now. Are those white flowers belonging to roses or to winter jasmine? Winter Jasmine = Jasminum nudiflorum. The white/yellow flowers are small roses. Rose Summertime. Thank you, TT. It is really very nice evergreen. How long does it take to grow up to that size, please? The area is getting plenty of rain this week ! The wishing well is an heirloom. It was hand-made for my mother many years ago, but had fallen into disrepair. A while back, I gave the well a bright make-over, but I've only now found the right place to fit it into my garden. I dont know how you do it Terra, but even your big shrubs look graceful and well behaved...some people have all the knack!! lol! Its gorgeous. Thank you. This summer, more than even before, I've spent lots of time up ladders, pruning large shrubs and climbers ! The weather has made everything grow at an amazing rate ! Take care up those ladders Terra, take a mobile with you in case.. However, it has certainly paid off! There are one or five shrubs at my place that need some tlc......lol! I like to include a lot of evergreen plants and shrubs for winter interest. These areas of my gardens face the sunshine in the morning, and then in the evening the sun drops down at the back behind the trees. 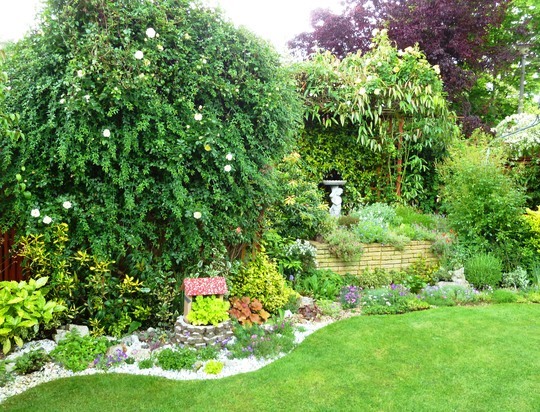 I've put more pictures of the Wishing Garden in my current blog. I agree with Tetrach, Terra. That's a kind comment. In the past I would plant shrubs etc. with little thought as to colours or whether they needed shade or sun. I've learnt by trial and error, and by looking at GoY ! Conker and Truffle worked very hard on their design for the Wishing Garden. I do love this wishing well border, it's so colourful. It's looking very green this year with all the rain ! I'm wishing that i could have a Wishing garden that looked like yours! I've just checked and Heuchera "Miracle" becomes available in August 2012 ! It's really beautiful! And all this greenary makes it so relaxing! It turned out even better than I had hoped... Lol !